During an interview, an employer may ask about your work style to decide whether you will fit in well with the company culture and the requirements of the job. This question also reveals to the employer whether you are self-aware enough to recognize and clearly communicate your work style. While this question might seem vague, it is a useful open-ended question that allows you to put yourself in the most positive light. When answering this question, it is important to keep the particular job in mind. Avoid clichés (like “hard worker” and “good communication skills”) and focus on specific elements of your work style that fit the position and company. Do your research before the job interview. Analyze the job listing to match your qualifications with their requirements, and prepare answers that show how your work style makes you the best candidate for the job. Then, go a little further. Review the company’s website, media kit (almost always available on their site), and social media presence to learn which qualities are most valued at the organization. Most employers have a strong idea of the kind of person who’ll succeed on their team. It’s also important to be honest, while still highlighting the positive. Don’t claim to be a perfectionist if you’re a big-picture person; instead, emphasize your vision and commitment to quality. Speed and accuracy – If you work quickly and efficiently, you might mention this in your answer, especially if the job requires meeting tight deadlines. However, it's important to impress the interviewer with your competency and accuracy, rather than just your speed. If you say you work at a fast and steady pace, emphasize the strategies you use to avoid making mistakes. Structuring your day – You may want to focus on how you organize your day. Do you prefer to do your most difficult tasks in the morning? Do you prefer to focus on one assignment at a time, or multitask? You might also mention how many hours you typically work. If you are someone who always goes above and beyond, and stays late to complete tasks, say so. Working alone or in collaboration – The employer might want to know if you prefer to work solo or in collaboration. Think carefully about the job before answering this question. Most jobs require at least some collaboration, so even if you prefer working alone, emphasize that you value others’ input. Taking direction – Another important element of your work style is how you like to communicate with your boss. Do you prefer to take constant direction, or do you like to be given a task and left alone to complete it? Thinking about your ideal relationship with your employer will help both you and the interviewer decide if you are a good fit for the job. Your communication style – If this job requires constant communication, you might want to emphasize how you communicate with employers, staff, and clients throughout the workday. Do you prefer email, phone conversations, or in-person meetings? Again, think about what this job requires before you answer. 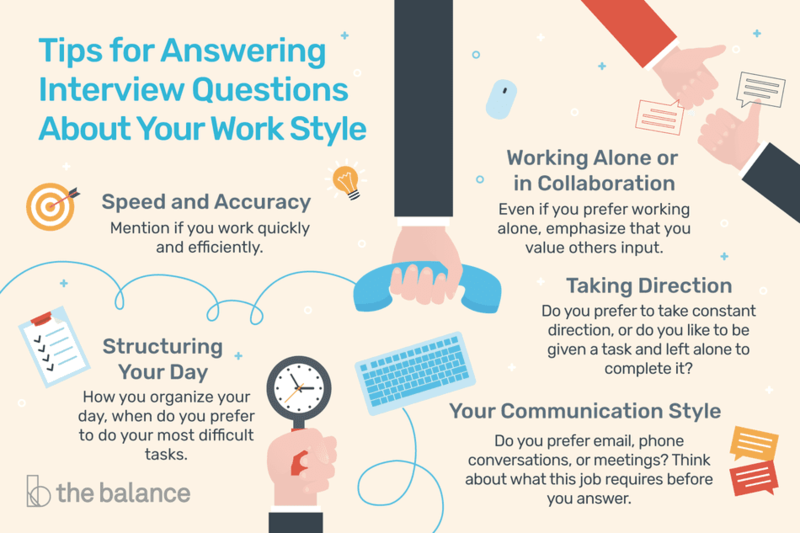 You obviously cannot mention all of these elements of work style in your answer. Focus on a couple of elements that you think demonstrate your best qualities and that fit with the job at hand. If you have a little extra time, consider including a brief example or two that emphasize your work style. For example, mention a time when your efficiency and ability to multitask helped you complete an assignment a week in advance. My work style is extremely flexible – working on so many different projects requires me to be adaptive. In general, I try to work on one project at a time, working as quickly but efficiently as possible to achieve the highest results. All of my projects require collaboration, so I use the team environment to check for errors. I am a perfectionist and a driven worker, and I think my clear communication skills allow me to bring out the best in any team, in any project. I am extremely dependable. I have rarely missed a day of work, and am known for coming in early and staying late to finish important tasks and achieve results. This dependability extends to my collaborative work as well. I always meet deadlines and help my teammates to meet theirs as well. For example, on my last project, a teammate was struggling to complete his assignment for the team, and I stayed late every day that week to help him not only complete his assignment but exceed our initial estimations for the project. I'm always on top of my projects. Due to my organizational skills and efficiency, I can juggle multiple projects at once with success. While I complete most of my work independently, I greatly value input and will consult with team members to ensure we're all on the same track. I also appreciate checking in regularly with my boss to update her on my progress and ask about any issues that have arisen. This open communication helps me complete tasks efficiently and accurately.